The practice of architecture is one of longevity. The buildings themselves are usually intended to last a long time, but the process to get the buildings built is also a long and often complicated one. This page looks at works currently on the board and tracks the process of these projects. The stages within the practice of architecture start well before construction. From the early briefing the original design is critical to ensure the success of the end product. How well does the concept suite the brief, the site, the budget, the aesthetic requirements and more are all vital for the next phases within the project. What happens with those concepts during the detail design, costings, and construction is an interesting journey that is often overlooked for the final glossy building image. This page aims to track the process to reveal the journey behind the building. Backyard sanctuary. This existing hardwood shed provides fantastic space to expand the outdoor lifestyle required when living in Cairns. It does however need some love to optimise the functionality for this small family. Apart from a general tidy up the program requires an office space, storage and kitchenette, better weather protection and ventilation. New roof lining will include an extra long overhang and re-located truss bracing, allowing the mezzanine to be used as a kids hideaway. Only partially hidden behind vines to shade and clean the air and allow passive surveillance from the house. New opaque sheeting in the existing custom orb walls will allow natural filtered light and open the upper level to enhance cross flow ventilation. This project is all about creating fun spaces that make outdoor learning exciting and double up function for play space and parent comfort. A series of courtyard spaces between existing buildings (and under existing roofs) are to be converted to include water play, terrace seating connecting the oval, soft fall turf and mounds, climbing elements and fun wave seating. Alternating surface finishes and meandering, wavy and curved seating overlap to provide a soft connection between spaces, each with their own purpose and identity. This is about taking the learning environment outside and coupling it with play, so both functions overlap. Socialising and learning spaces merge and therefore the act of learning is not isolated to the indoors but continues into the outside world. The space between the buildings is the highlight here. A new courtyard and building refurbishment in the centre of the school aims to provide a starting point to transform the entire campus with active circulation and new colours schemes. Currently suffering significant erosion this rabbit run is a dust bowl between buildings with no student amenity. The new works aims to stabilise the ground, formalise the access route and provide multipurpose zones that service students during lunch and as outdoor learning areas. The creation of terraces, retaining seats and landscaped embankments utilises the hill to our advantage and turns an uninhabitable space into an extension of the adjoining classrooms. As part of the works the existing 70's block classroom building will be refitted to provide large openings and operable walls to give an entire precinct that caters for flexible contemporary pedagogy. This small extension project involves updating a 60's style bungalow to make it better suite the new owners needs. Some internal renovations to expand the living and kitchen into what is currently the garage space while adding new large outdoor living zone. Some wet area renovations and a new 3 car garage complete the project. The client wanted to maintain the existing aesthetic of the 60's character so the new works tie into the bungalow utilising similar detailing and finishes.This is an owner builder project so documentation and site roles are limited. Our own house in the gold coast hinterlands is an ongoing project that will explore design ideas and techniques over many years. After recently moving into a somewhat neglected 1920's weatherboard house on almost 3 acres we aim to slowly transform it into our oasis. This will be a long process with most of the work exploratory and hopefully self constructed. The first urgent project was the deck. There was an existing deck that was rotten with holes in the floor and large sections of the balustrade missing. With a 2 year old in the house this was a priority to fix and needed to be completed without experiencing the local changing climatic conditions. With the deck on the south and eastern side of the house we needed to roof most of it for protection but keep the north section open to allow the winter sun to penetrate. We removed everything to reveal the floor framing (which was kept), removed the central columns to allow cars through underneath and built up from there. New spotted gum decking, open balustrade and roof sloping away from the house to maximise the views framed off secondary beams to avoid roof penetrations and provide soft strip uplighting . The infloor hammock is an idea to provide a bit of fun and provide a relaxing space to take advantage of the northern sun and the incredible view. Finding someone to make it however was a challenge. In the end we had a sail maker rope the net to size and installed this ourselves through SS eyebolts fixed through the decking joists. Set on an acre in the Western suburbs of Brisbane this is the house the client has been dreaming of building for years. With a large family intending to stay around for a while to come this house needs to provide a lot of space for a large number of people. While combining traditional formality and modern aesthetics this house is meant to provide a hotel feel with some homely warmth. Watch this space as the early concepts develop into a finished product. Set within councils heritage control areas this subdivision required the new townhouses to reference existing aesthetics of the neighbourhood. While trying not to replicate traditional details this design takes on elements to tie into the existing house, such as roof pitches, eyes on the street and general massing, all with a slightly modern feeling. 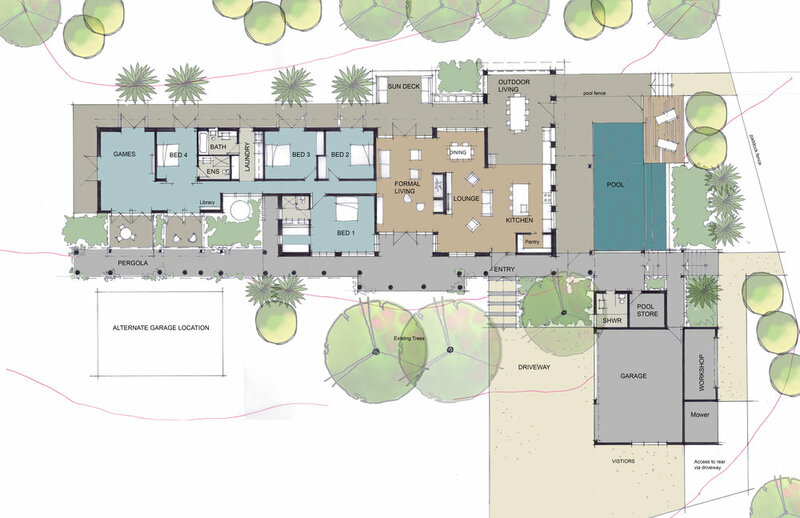 As a developer driven project this design seeks to maximise yield while maintaining quality of space, including privacy, open plan living with covered outdoor areas on the north and back to the street. Each townhouse includes 3 bedrooms with Multi function room on ground floor directly accessing the north facing courtyards. The garage is set back to allow secondary car park and the existing house built in underneath to maximise functionality while opening onto the yard. We are very pleased to have been working with ACU at the Brisbane (MaCauley at Banyo) Campus on a number of interconnecting projects. ACU recognises that a successful modern university campus is as much about the common space activation as it is the teaching space. Providing healthy, active environments that encourage student engagement and interaction is key to enhancing the education experience and retaining student numbers. The relatively new campus has fantastic academic facilities but has under utilised its extensive grounds and incidental gathering and co-curricular spaces. 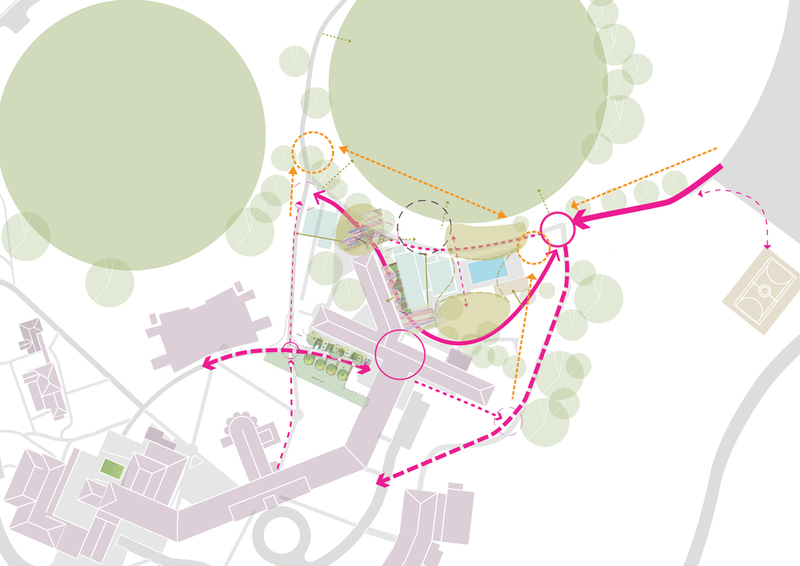 Identifying potential Hubs, Active Edges and Retreat spaces throughout the campus Resonance d+a is working through design concepts to enhance these areas with the provision of shade, seating and services. As part of the activation works we are also decentralising the coffee and food distribution. The inclusion of a coffee outlet within one of the shade structures outside the lecture halls will assist in re-vitalising the north facing courtyard and will provide charging and wifi capabilities in the building surrounds. All of these works are now complete and available for viewing in the education section. Below are some of the works that did not proceed. Following the successful completion of Stage 2-4 Resonance d+a has been continuing to work with Aquinas College on developing the next phase of the master plan. Stage 5 includes a new and revamped administration building and resource centre that aims to re-invigorate the original 60's building while providing a contemporary interpretation for the new works and a new face for the college. The concept design proposes to demolish the small 70 and 80's single storey 'add ons' and open up the original 60's entry. A new 2 storey building at the front of the site provides a street frontage and lightly links into the existing building while framing the entry promenade. Problematically the new layout brings the public reception closer to the heart of the school with a twin faced reception (one side for public and the other for students) to create a clear delineation of space while providing efficiency of space. The management team is housed in offices facing each other across a private courtyard that forms the link between the old and new buildings. Open plan staff offices are further removed to provide separation from the students for retreat, with the staff rec room on the second storey with views to the gold coast and incidental viewing over the street frontage for surveillance purposes. Set on a rural residential property the EL house is designed with family in mind. The second dwelling on the family property this is all about lifestyle and external living. With the land gently sloping North the L shaped house allows all rooms to open to both the east and the north and overlook the north facing courtyard. Set underneath a few large existing gum trees the courtyard is enclosed by an open fireplace and pizza oven. A perfect setting for music and campfires under the trees the outdoor room completes the house merging with the on grade living room. The upper level consists of the bedrooms and messy spaces. Overlooking the northern courtyard the open study and kids space flank a void over the kitchen / dining and allow light and breezes to penetrate deep into the heart of the house. A roof top viewing deck within the treetops affords glimpses of the gold coast and back into the active central courtyard.